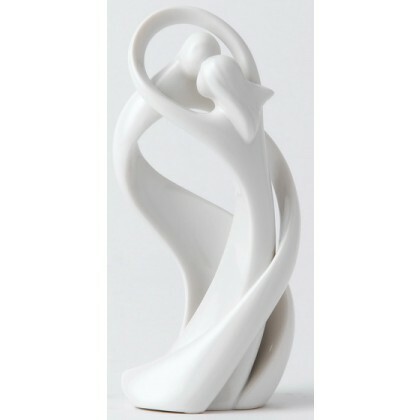 Stunning porcelain Circle of Love Figurines portray the emotive themes of love and family through flowing lines and entwined circles. Designed by Kim Lawrence the sculptures are inspired by emotions of love, commitment, peace, contentment and family. Circle of Love figurines make meaningful gifts but are especially appropriate for landmark occasions such as weddings, anniversaries, engagements and birthdays. Such simple, elegant design in porcelain, coupled with sentiments of love, friendship and family ensure that these exquisite figurines will remain the best choice for gift giving for a long time to come. This figurine is approximately 6" high. An ideal cake topper for engagement or wedding cakes.